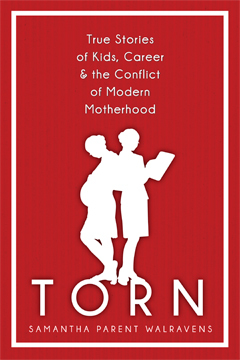 On June 7, 2011, New York Times reporter Lisa Belkin chose Torn: True Stories of Kids, Career & the Conflict of Modern Motherhood (ISBN: 978-1-60381-097-5, $18.95, 288 pp. ), edited by Samantha Parent Walravens, as the first selection of the NYT’s Motherlode book club. The lively conversation—one of the eight posts drew 195 comments—continued until the end of the month. These posts addressed the gamut of parenthood-related topics, including the role of the modern dad, motherhood in countries with superior social safety nets, which jobs and how many hours a “good” mother should work. Those who did not feel “torn” or considered the entire subject to be self-indulgent and irrelevant to their lives had their say as well. A special thank you to Lisa Belkin for her thoughtful, sensitive, and balanced moderation of the TORN discussion. Thank you, also, to the many TORN contributors who also took the time to respond to posts and comments. What these posts make abundantly clear is that Motherhood Versus Career remains a hot-button issue for parents everywhere. Samantha Parent Walravens can rest assured that her book has brought enjoyment and affirmation to a great many readers. In her first column, Lisa Belkin summed up the dilemma of TORN’s 47 contributors as follows: “All of them have one thing in common—they have all compromised. Whether theirs is a compromise they can live with is the central question.” This first post drew 86 comments from moms and dads of all ages and from all over the world, many eager to take part. Lisa quotes TORN contributor Karen Sibert, M.D., who suggests that women who are considering motherhood should think twice before going to medical school and taking up coveted spots in highly competitive programs: “They must understand that medical education is a privilege, not an entitlement, and it confers a real moral obligation to serve.” Lisa suggests that in a saner world, women should be able to be both doctors and mothers, and that the problem lies more with the “archaic structure” of these professions: “The answer is to recalibrate the hours and expectations.” She argues that any career that demands more than a balanced human being can offer is not sustainable. One hundred ninety-five readers responded. Predictably, tempers ran hot for both arguments. “Are we really having this conversation in 2011?” one reader asked. Lisa quotes a reader who tried to take on the “dad” role of main breadwinner while her husband stayed home. In the end, she cut way back on her hours because she missed her children so much. She concluded that the biological pull between a mother and a child is more powerful than that of a father and a child. Readers also cited the power of social conditioning. Society still does not approve of mothers who assume the main role of “provider,” allowing others to raise her children. Lisa interviews TORN’s editor, Samantha Walravens, about the book and discusses reader reactions. With so many essays, women seemed to be looking for their own stories, for confirmation. If they didn’t find them, they expressed anger and frustration. Lisa felt they were missing the point, which was not to find one’s own story, but to learn from the stories of others. Ninety readers commented. Lisa quoted a 28-year-old who gave up a science career for a job in baking with the idea that the less demanding career would allow her to be a better mother. In the 99 comments that followed, some readers applauded the woman’s foresight, but others warned that no matter how much you planned ahead, fate could intervene. If she wasn’t able to have children, she would have given up her ambitions for nothing. Another woman who had done just that—chosen a slow-lane career for the sake of her future children—now wondered what she had missed. One reader pointed out that so far the discussion had mostly centered around stay-at-home versus working moms. For those who did work, she wondered if European women were a little less “torn”: “I am most curious about parents’ experiences from countries with the great leave policies that Americans only read about.” European women responded that yes, one to three years of family leave did make a difference, as did government sponsored daycare and the proximity of extended families. Lisa welcomed a father as her guest blogger. This father had not been “torn”—he even mentions society’s “glorification” of stay-at-home-fatherhood—until he read TORN; then he started to worry that his own daughters would end up “torn” because of his choice to stay home. He asked, “Am I somehow setting an example of dependence that could backfire in the future?” He found himself taking on the worries of the SAHMs he read about in TORN: what if he needed to support himself and his children in the future? Had his skills atrophied? Would he still be able to get work? Many women responded with sympathy and offered strategies about how to stay viable in the workforce while still staying home with the children. In her final TORN post, Lisa discusses how many Gen X women are choosing independence and earning power over having children. These women were raised by mothers more concerned with their children having careers than families of their own. Many readers asked if Gen X women were really choosing not to have children or just delaying that decision longer.